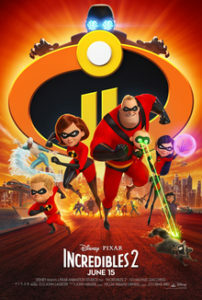 We will be showing The Incredibles 2. In conjunction with the Free Table of Grace Dinners at the Vergennes Congregational Church at 30 South Water Street – Bixby will be offering a free family friendly movie after the meal. The Free Meals run from 5:30-6:30pm, take outs are available and you are welcome to bring your dinner or desert to the library. Movie begins at 6:30pm.